With the possible exception of the similarly sparse MARTIN, Romero never made a movie as cynical, powerful and pared-down as this, the quintessential modern horror movie and a movie that still startles despite certain dated trappings (notably, that library-sourced, shrill music score). Enormously influential from the very start, its jarring preamble inspired (among others) THE TEXAS CHAIN SAW MASSACRE with its graveyard imagery and prophetic radio bulletins, as the ill-fated Johnny parodies Boris Karloff – thus distinguishing this horror film from its more escapist classical predecessors – before falling victim to a zombie that, initially, looks no more threatening than the town drunk shambling home after closing time. Thereafter, nothing goes as we might expect or want: our heroine Barbara (Judith O’Dea) veers from hysteria to outright catatonia, the small group of survivors constantly disagree and make all the wrong decisions and no satisfying explanations are given as news anchor-men struggle to comprehend the horrors befalling the whole country. Slowly, it becomes apparent that the zombies are less disturbing than the emergent lynch mobs who (ultimately) dictate the fate of our hero (Duane Jones); the leader of the zombie-hunting brigade has a key speech in which he rants “Beat em or burn em, they go up pretty easy…” with the sadistic relish of a Klansman. For many fans, DAWN remains the highlight of Romero’s DEAD series, perhaps because it’s the only one of the original trilogy to have fun with the concepts that, in NIGHT and DAY, are treated as exercises in claustrophobic misanthropy. DAWN sets up its tonal shift immediately, with a fast-paced opening half-hour rife with violent action, comedic banter between the male leads and a comical variety of zombies that stretches to undead nuns, Hare Krishna ghouls and ill-fated zombie schoolkids. DAWN ushered in a new era of splatter cinema, with Tom Savini’s crowd-pleasing work peaking early on with perhaps cinema’s most spectacular (non-SCANNERS) exploding head. Slyly referencing NIGHT in its dialogue (“Those rednecks are probably enjoying the whole thing”), the movie establishes welcome continuity with the 1968 film, opening in a TV news room while the nation plunges into a state of emergency. It has the flattest acting of any DEAD movie: Gaylen Ross and David Emge are less charismatic than even the blankest of the zombies, though Ken Foree is a commanding presence as the series’ second dynamic black lead, delivering the movie’s most iconic line of dialogue: “When there’s no more room in Hell, the dead will walk the Earth”. As before, the threat posed by the zombies is constantly subverted, and they are far less terrifying than the scientists we glimpse contemplating the possibility of nuking major cities. Transformed into an overstated but witty metaphor for our shambling, 20th century consumerist society, the zombies are at the core of sequences veering wildly from custard pie slapstick to alarming gut-ripping gore. A rare sequel that expands upon its predecessor’s key themes while crafting a vivid, influential identity of its own, DAWN continues to undermine our expectations at the very end, nixing the expected nihilistic fade-out for a hopeful final scene instead. Once deemed a disappointment, the finale of Romero’s original DEAD trilogy only improves with age, overcoming the budgetary restrictions that reduced its original conception, to endure as an intense, theatrical experience closer to NIGHT than DAWN. In the big zombie year of 1985, DAWN lost the box office battle to RE-ANIMATOR, which built upon the splatstick humour of DAWN and RETURN OF THE LIVING DEAD – the latter ironically beginning as a spoof before turning serious for the kind of nihilistic climax that Romero himself had grown out of by DAY. “All the shopping malls are closed…” someone observes as the film opens where DAWN ended, establishing that zombies now outnumber the living 400,000 to one, though the characters holed up in an underground bunker speculate they may be the only ones left. The eerie apocalyptic opening scenes (influential to the opening of 28 DAYS LATER and TV’s “The Walking Dead”) set the bleak tone and we quickly learn the reassuring adage of “Shoot ‘em in the head” is no longer a viable way forward. Slightly mad doctor Richard Liberty works to control the undead, domesticating his pet project “Bub” (the marvellous Howard Sherman) by teaching him to shave, read and appreciate music. Almost all the other men are chauvinistic bastards or ineffectual cowards, allowing Lori Cardille to craft the strongest of the DEAD films’ female characters. Romero’s punchy, profane script makes this a rare horror film with absorbing, extended dialogue sequences and several meaty characterisations. Bursts of gore and action punctuate the wordy first hour, before a fabulously paced final furlong comprising Tom Savini’s greatest gore FX, capped by Joe Pilato’s legendary cry of “Choke on ‘em!” as his body is ripped apart. Superbly edited and directed by a filmmaker at the peak of his powers, DAY also has an underrated score by John Harrison, who nicely captures the evocative pulse-pounding Goblin sound without sounding overly derivative or dated. The famous copyright faux-pas on the original NIGHT following its late-stage name change became a major driver for its key personnel (Romero, Russell Streiner, John Russo) to produce a contemporary remake written by Romero and directed by DAWN / DAY FX prodigy Savini. It repeats iconic dialogue (opening with “They’re coming to get you Barbara…”) and strives to recreate the original’s intensity, striving to make the undead frightening and repellent again after the late 80’s trend for jokey American zombie movies (themselves inspired by the slapstick element of Romero’s DAWN OF THE DEAD). The script doesn’t often divert from the earlier film (it still amounts to an extended debate about staying upstairs or taking refuge in the cellar), and some recreated scenes pale in comparison to their predecessors – particularly a weak reworking of Romero’s shocking matricide interlude. However, the riffs on expectation play well, with Barbara effectively recreated by Patricia Tallman as a shotgun-toting, vest-wearing post-Ripley survivalist. A pre-CANDYMAN Tony Todd was an excellent choice to replace the physically similar Duane Jones, while horror regulars Tom Towles, Bill Moseley and William Butler all add something to the mix. It inevitably lacks the suffocating, nightmarish monochrome look and feel of the 1968 film, and fails to truly reflect its own era (despite a fleeting hint of the outbreak’s origins in a post-AIDS virus), but Romero’s script offers a satisfyingly grim extension of the original’s famously nihilistic ending, with the surviving Barbara emerging into a new world order where she feels compelled to kill a fellow human in cold blood, resigned to fate:: “They’re us. We’re them and they’re us…” Described by Savini himself, in retrospect, as a “sterile” movie following multiple, never-restored MPAA cuts, the remake is indeed unusually bloodless for its genre (deleted gore footage is available on YouTube) though Savini’s desire to offer realistic depictions of walking death remain impressive, particularly the freshly autopsied zombie that attacks Barbara in the cemetery sequence. In the two decades that separated DAY OF THE DEAD and LAND OF THE DEAD, George Romero’s directing output was sparse and compromised, and his dismissal from the film adaptation of RESIDENT EVIL proved ironic when it became a big success, prompting Universal to fund a remake of his own DAWN OF THE DEAD, which itself proved lucrative enough to encourage the same studio to bankroll his long-mooted fourth “Dead” movie. Although not universally loved, LAND has a lot to commend, from a splendidly foreboding opening sequence to Dennis Hopper’s George Bush-esque governor, overseeing the fortified city of Fiddler’s Green for the wealthier survivors of the undead apocalypse. While the living continue to disintegrate, the zombies have evolved; Romero’s traditional favouring of a black hero has now shifted to a central black zombie ringleader named “Big Daddy”, a reflection of where his allegiance now lies. Punctuated by inventive gore gags, novelty zombies (an undead brass band, zombie cheerleaders) and witty side-lines (arcade games named “No Head Shots” and “Take your Picture With A Zombie”), LAND was Romero’s first ever R-rated major studio zombie movie but it doesn’t stint on gruesome detail or subversive commentary. Bitterly reflecting the post-9/11 world, Romero substitutes the notion of George W Bush enjoying a golf game while his mythical “War On Terror” annihilates villages and civilians in “terrorist”-heavy foreign climes, with the sight of Hopper safely overseeing the machinations of “Dead Reckoning”, an armoured truck mowing down everyone in the city streets in the interest of security. When Hooper’s tower, the financial centre of what remains of the recognisable modern world, comes under attack, the grim reminders of the Twin Towers (“What was built to keep people safe is going to trap them inside”) are unsubtle but powerful, as is the dialogue throughout. Bold and riveting, it culminates with surprises and a typically ambiguous Romero ending, though nothing matches the visualisation of the film’s poster image: scores of zombies emerging from the water as they head to Hooper’s “impenetrable” HQ. 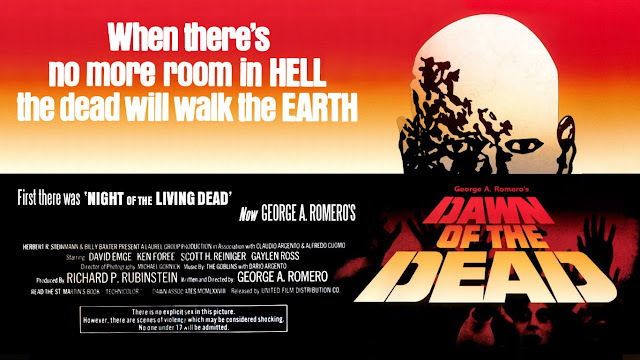 In the same year as the stylistically similar THE ZOMBIE DIARIES, Romero returned to the small scale roots of his 40 year old zombie saga with a film made cheaply with a cast of unknowns. DIARY, like NIGHT, offers a microcosm of a zombie-based apocalypse as it begins to unfold but this time updates the perspective for the post-BLAIR WITCH PROJECT / You Tube generation where, as one character states, nothing is “real” until it is on camera. Romero has playful fun with the set-up, as a bunch of Pittsburgh film students craft a suitably cliché-ridden horror film in the woods (he also slips in a joke at the expense of the post-28 DAYS LATER trend for sprinting zombies), but things turn serious when they find themselves caught in a swiftly escalating epidemic of the rising dead. The media in all of its 21st century forms proves no more useful than the sparse access afforded to the 1968 protagonists, so one of the students (Joshua Close) documents the unfolding horrors as they hit the road in a Winnebago. Employing the now vastly over-familiar “found-footage” technique while commenting intelligently on a society where our first thought during a disaster is “Did I get that on tape” rather than “are my friends / family OK?”, Romero proffers a bleak insight into our media-saturated, ambulance chasing culture – reinforced by Michelle Morgan’s sombre narration. In NIGHT, the characters were too busy antagonising each other to come up with a viable survival plan; here, they are too caught up in getting their voice heard, getting their footage uploaded. In DIARY, the characters have the technology to create their own “truth” but no one is any better off: the presence of limitless channels of information merely means a limitless array of contradictory reports and confusing interpretations of “reality”. The human race has learned nothing in four decades: the authorities still make matters worse rather than offering a solution, and, in the wake of mass-broadcast disasters like Hurricane Katrina and 9/11, the movie’s sense of widespread confusion and panic (amplified by the media) makes deeply uneasy viewing. There’s a reprise of a key entrail-spilling moment from DAY OF THE DEAD amidst the splatter highlights, and Romero retains the gallows humour of his classic zombie outing (note the zombie clown) though DIARY’s triumph is in Romero’s continued ability to make angry, socially relevant zombie films. It’s an overwhelmingly bleak mediation on a society where everyone is keen to put their experiences on film / tape / disc but no one stops to ponder over who will be left to watch. Appropriately enough, the final stages show the changing world, for all its advanced technologies, resorting to the same primal behaviour of the rednecks at the end of NIGHT OF THE LIVING DEAD. As the film reaches its haunting end, the heroine reflects on the crisis with a question (“Are we worth saving?”) that has a horribly obvious answer. Like LAND, DIARY was not embraced by all genre fans, and it isn’t perfect (some of the acting is shaky, and the CG intrusions are unfortunate) but it remains Romero’s last truly great zombie movie and one of the smartest cinematic distillations of our 21st century culture of fear. Romero’s third zombie movie in four years uses a secondary character (squad leader Alan Van Sprang, seen in both LAND and DIARY) to act as a bridge to a new story, but otherwise offers an opposing visual and narrative aesthetic to its immediate predecessors: this is a conventionally shot, widescreen zombie take on THE BIG COUNTRY. Unfolding six days after DIARY, this takes place on Delaware Island, where the O’Flynn family and the Mundoon clan are at loggerheads as to how to deal with the zombie epidemic. The former take the zero tolerance, exterminate-them route, while the Muldoons believe they should keep the undead in shackles and devote energies to finding a cure. Despite the fresh genre cross-pollination, SURVIVAL unfolds in a familiar Romero-esque world, where the zombies have become bait for sports and cheap kicks (as in DIARY), carry on the menial tasks they performed when alive (love the zombie mailman) and are sometimes even irrelevant to the main narrative. It’s a bloodier movie than DIARY, and there are novel elements: the zombies find new sources of food (a horse is ripped apart in the grossest sequence) and some of the more original zombie-killing methods amuse, though the increase in CGI gore gags is notably jarring. The premise allows Romero to stage his first bonafide western, complete with effective scope compositions and feuding families, though the genre parallels extend to an overly leisurely pace and a peculiar absence of true threat. Nonetheless, if you take it as Romero’s opportunity to kick back and have fun with his monsters, it’s an enjoyable offering, and the punchline is marvellous: undead versions of patriarchs Kenneth Welsh and Richard Fitzpatrick continue their feud beyond the grave, impotently firing empty guns at each other for, one assumes, what will be an eternity. There’s no greater depiction of ridiculous stubborn male bullheadedness than that.